It’s been a while since last time we published a post with big rarities, so this is one is meant to be helpful for you to track some of the most awesome things that are going on right now on eBay. Keep your radar on while you read this! The first cards I’d like to show you are three Revised Edition Miscut Underground Sea. Two of them are extreme miscut and are showing the bottom part of the card Island Fish Jasconius on the top of it, just like the one in the picture to the right. 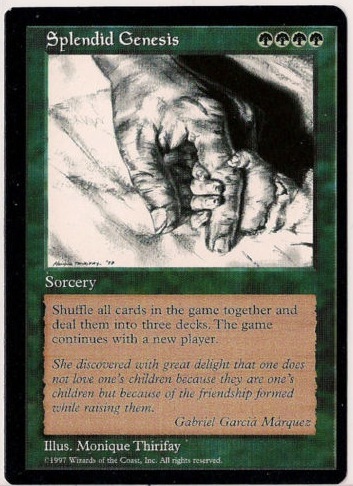 This type of miscut on highly playable cards can increase the value of the card up to 100 times from its original version. For instance, an extreme miscut Brainstorm (just like the one I have), that cost $2 on its regular version, could easily overpass the $200 barrier. So, now think of the price of one of these Underground Sea. In fact, these cards are actually more rare than any Alpha/Beta Underground Sea, and that should give you a little hint of how much is people willing to pay for them. But if you still aren’t convinced, make sure to click on the images to discover their prices. Keep reading if you’d like to see the other two Underground Sea and many, many, MANY more rarities, such as an Splendid Genesis or an awesome artist altered Ancestral Recall! The third one isn’t in a perfect NM condition and it’s not as miscut as the first two, this is why the price of it is much, much lower. BUT, it’s a good starting point if you wanna have one of the coolest playsets of Underground Sea ever! Let’s move on from miscuts to alterations now. 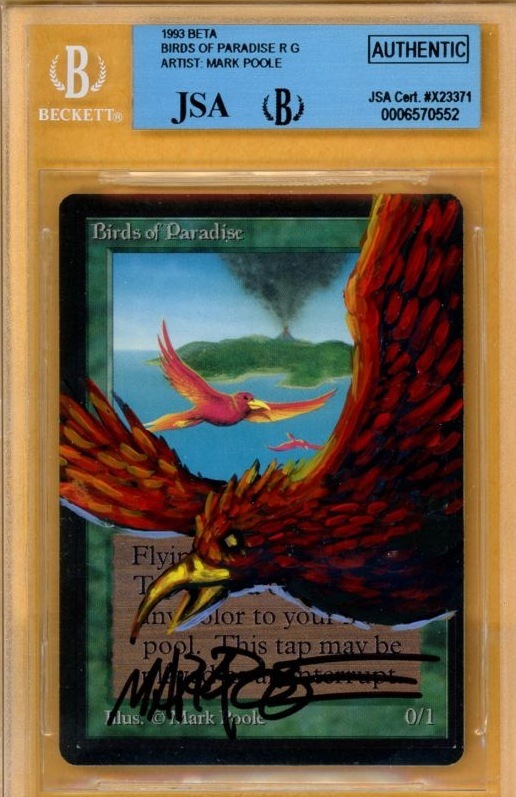 The following two cards were altered by the artist Mark Poole. These two alterations are very famous for being the first ever alterations he did with color paint. They’ve changed owner several times and it’s now your chance to buy them. Be aware, these two hotties ain’t cheap either! Additionally, both cards have been certified by the Beckett grading company to authentize the cards. AND, I’d like to mention as well the slight miscut on both cards. As you can see they are moved from their center! I’ve seen several other Mark Poole alterations, including one Beta Island of my own collection, but none of them are as nice as these two. Well, well… if your pocket couldn’t afford any of the cards posted above (which is totally understandable and normal), don’t be too surprised when you’ll see the price on the following card: Splendid Genesis. Let me explain you a little bit more about this card. Splendid Genesis is one of the rarest cards created by Richard Garfield. He created 110 copies of this particular card, handing it out only to close friends and highly-regarded Wizards of the Coast employees. The card itself was made to celebrate the birth of Richard’s first child. 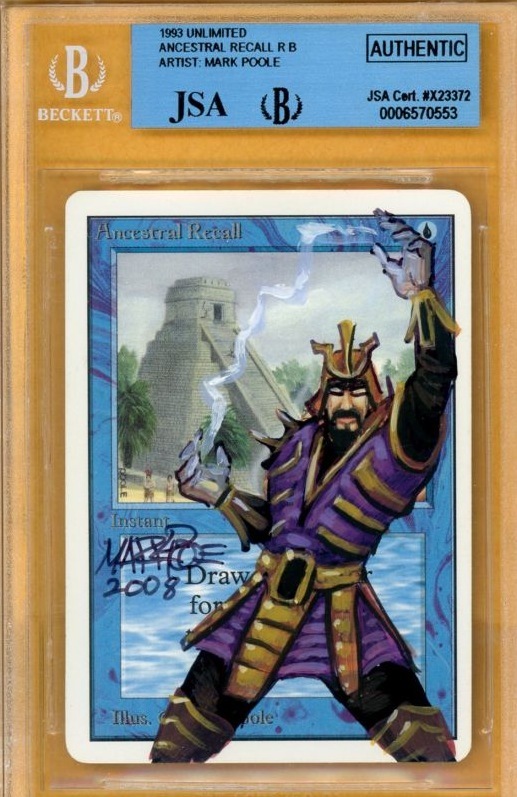 Consequently, the intention and rarity of this item make it an extremely rare and valuable part of Magic’s rich history. If you believe that’s not rare enough for you, sit tight because this is the only copy that is miscut! But, let me tell you one last thing: Splendid Genesis contains a typo mistake on it, which makes it a misprint too! 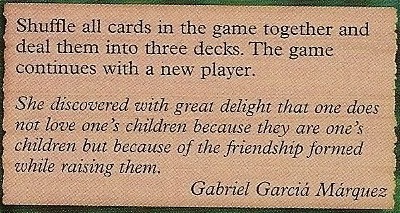 The flavour quoted text belongs to Gabriel García Márquez. If you check out the name carefully, you’ll see that the last name it’s been mispelled. They placed the accent on the last A instead of the I. How pimp is that? I really appreciate the time and effort spent by some collectors in some ocasions, and despite not having the money to spend on this set, I totally understand the price that has been set. This is it for today’s BIG Pimpin – What’s on the radar? I hope it helps you track those really hard to find pieces even though you can’t afford them. Next time, more pimp, more rarities and who knows, maybe there’s gonna be something you can afford!